Back in 1998, Breakfast Club consisted of Jimmy, Judy, Alex, and Fern. I was in college in New York, and after that in Nashville in grad school (or as I call it, hell on earth) for three years. Those were dark, dark times, and breakfast club happenings from then are rarely discussed now. Back then the Day By Day was an old standard. It might be the charter member of the "Official Breakfast Club Old Standards". It fell out of favor though, due to a variety of reasons, it's a long drive to St. Paul, there is often a long wait for a table, there were a couple of bad eating experiences, etc. By the time I returned to the Twin Cities and became an active member of breakfast club, the Day By Day had fallen off the map. Until yesterday. As per usual, we were sitting around Jimmy and Judy's kitchen table playing our favorite pre-Breakfast Club game, "Round Robin Veto". Here's how the game works, one person makes a suggestion to the group and provides evidence as to why we should go there ("Let's go to Bryant Lake Bowl, we haven't gone there in a while and they are going to close soon"). There is a three second pause, and someone else vetoes the suggestion and then states why it is a sucky idea ("Bryant Lake Bowl is too greasy, the tables are too small, and they don't have bottomless cups of coffee"). The vetoing person must then provide an alternative to be shot down by the rest of the group. We usually do one complete round before a decision is made. This used to happen in the car, on the way to the place, but now that we take two cars we have to decide before leaving the house. We had already vetoed seven places when someone suggested the Day By Day. There was a three second pause...and no veto. Not only was there no veto, there was genuine excitement for the idea. It had been a long time since we'd gone there and some people had never been there and it is always nice to have veterans and newbies to critique a place. Before long there were two cars speeding east on 94 towards St. Paul. Walking into the crowded restaurant, I my hopes faded that we would be able to eat soon. We had seven people (a nice guest appearance by cousin Perley) and seven is pushing the boundaries of an acceptable number of people for a breakfast joint. Not only were we seated almost immediately, we got a huge table in a relatively empty part of the restaurant. It was a very promising start. When we sat down, I actually exclaimed with joy. There were two bowls of cream. 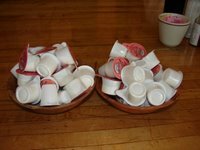 I'm not talking two pudding-dish sized bowls that hold three containers of half and half and force some members of the group (myself included) to horde cream for the entire meal, I'm talking two BOWLS of cream, each with a giant pile of half and half. Why had it taken us so long to come back? The meal itself was delightful. Everyone enjoyed their food tremendously. It was very traditional breakfast fare, which was good news for me. 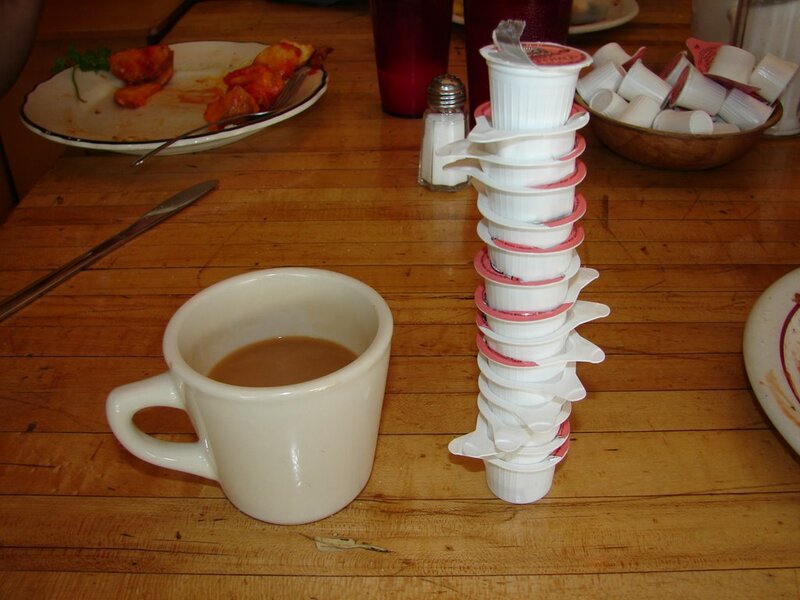 Jimmy and Perley both got something called the "heart stopper", which made me decide that all breakfast places should have a dish called the heart stopper. It only seems appropriate. Alex and I each had the breakfast burrito and enjoyed it thoroughly. The fresh avocado was a great addition. Judy got the special pancake and liked it, but complained that it was a little dry. She then confessed that she did not put any syrup on it, which would explain the dryness. Rachael and Fern both got a tradition type breakfast and gave it positive marks. The only bone of contention in the group was the potatoes. Most members of the group gave them poor marks because of their lack of crispiness. Other members gave the potatoes high marks because they were fresh and definitely never frozen. The search for perfect potatoes continues. A legitimate case for them being perfect could have been made if the cooks would have left them on the stove for five more minutes. They also get bonus points for giving you the option of American (Freedom?) fries or hash browns. 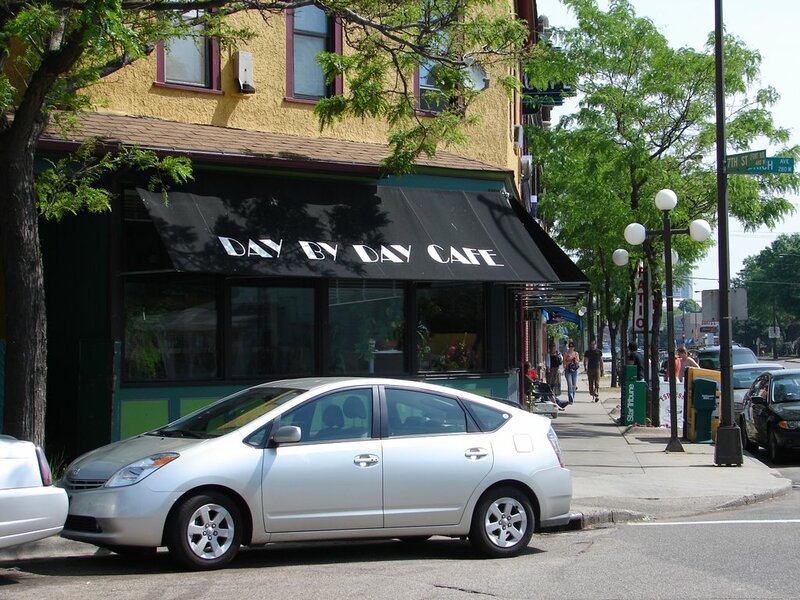 The Day By Day Cafe received a overall grade of B+/A- from the group. It might just have inserted itself back among the old standards. Welcome back old friend. I've always been a big fan of Day By Day. I'm the one who discovered it and brought it to the club, because I used to work at a day care center down the street. We used to go there a lot. Judy is the biggest vetoer of the place. Even though she is one of the least traditional eaters of breakfast in the group, crispy potatoes are very important to her. She may not order potatoes with her meal, especially now that she's eating healthy, but when she picks them off of Jimmy's plate, she wants them to be crispy, thank you very much. Anyway, I'm glad it's back on the list with some more supporters to keep it there. Oh, and the service is just the kind I like. They mostly leave you alone, but they never leave you without something you need. 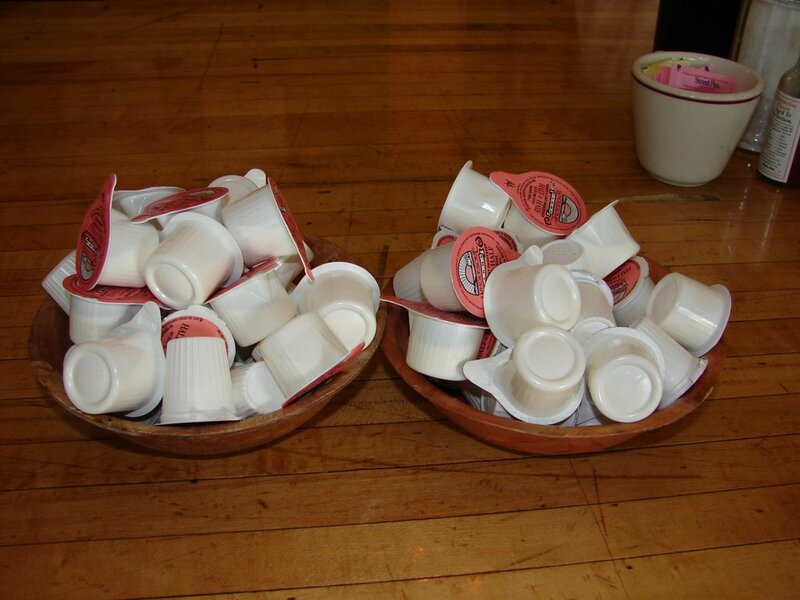 The big bowls of cream are indicative of this style of waitressing, as are the pots of coffee they leave on the table. There are even menus on the table when you get there. It's very down to business. You don't have to tell them that you are enjoying your meal. They can tell from all the empty plates and the customers who keep coming back. OK, I'm done filling the blog with comments. Rock on.